An unnamed man was beaten and tortured mercilessly in Calabar by some soldiers.According to Cyprianlah the man was alleged to be a thief and was caught and beaten today in Calabar by some soldiers after allegedly stealing from a woman. The man was reportedly said to have pretended to want to buy short knickers from a woman for N500.It was however reported that immediately the woman selling the under waers and men’s clothing put the money in her purse, the N500 and all the money in her purse disappeared. 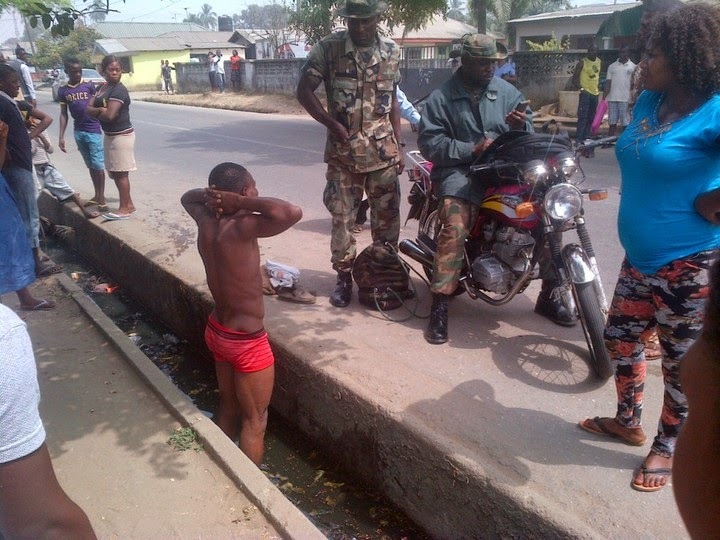 The soldiers chased and caught the man as he tried to make away before being caught.The soldiers tortured him, asking him to confess…they removed his clothes and made him swim in the gutter pool, beating him with a locally made cane called koboko. But guess what, while they were ‘torturing’ him the alleged money appeared back! Ghen Ghen!! And the eyewitness who reported this concluded by saying it was shocking and indeed strange things are happening.